The Lowdown: Great cast, great special effects, so-so story – better than 2014’s Godzilla (the first in Warners’ planned MonsterVerse), but falling short of being truly memorable. 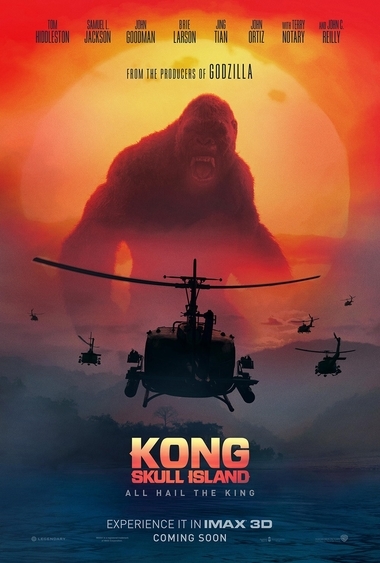 A decade ago, a film as action- and effects-packed as Kong: Skull Island would’ve been a much ballyhooed summer tent-pole. These days, every month is summer at the cinema. Skull Island was released in spring to cautiously optimistic audiences. A $61 million opening weekend seemed to confirm demand for a King Kong reboot. It has been 12 years since Peter Jackson’s overblown remake of the 1933 original. But Skull Island made wound up making considerably less than Jackson’s generally unloved 2005 effort (that’s without even accounting for inflation). Normally box office numbers don’t tell a terribly important part of the story, but when something feels this much like product they shouldn’t be ignored. Despite an overqualified cast and the best F/X money can buy, Skull Island comes across as a bit generic. Directed with competent efficiency by Jordan Vogt-Roberts (a relative newcomer, without previous action film experience), it’s entertaining but slight.The winking humor infused throughout cuts both ways; there’s lots of laughs, but there’s also very little gravity. In 2014, Warner Brothers unleashed the first film in a planned “MonsterVerse,” the deeply underwhelming Godzilla. Even though Skull Island is a drastic improvement, it couldn’t manage to even match Godzilla‘s gross. The execs at Warner should probably be wary about their costly upcoming series entries (Godzilla vs. Kong is currently slated for 2020). 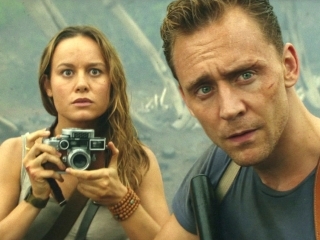 Set in 1973, Skull Island finds disillusioned ex-British Special Air Service Captain James Conrad (Tom Hiddleston) heading up an expedition to a South Pacific island shrouded in constant severe weather. He’s been hired by mysterious G-man Bill Randa (John Goodman), who’s rounded up a crew including pacifist photojournalist Mason Weaver (Brie Larson) and semi-crazed Lieutenant Colonel Preston Packard (Samuel L. Jackson). Ostensibly the mission is to map the uncharted island, but soon the gang encounters the gargantuan Kong (not to mention a host of other fantastic beasts). 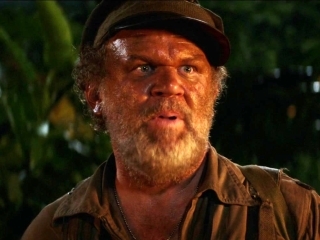 Stranded on Skull Island since World War II, daffy Lieutenant Hank Marlow (John C. Reilly) eventually meets Conrad and company. After nearly 30 years, Marlow knows the island’s many secrets. Most of the movie is given over to awe-inspiring battles between Kong, a vicious species of giant dino-lizards called skullcrawlers, and the intrepid humans. Or at least the intent was to inspire awe. These CG-spectacles are wearying, especially when stretched to cover the entire third act of the film. It’s the cast (particularly Reilly) that makes Skull Island fun in spite of its bombast. Hopefully future installments keep the focus on the character-based elements.